I need help with my program in Visual Studio C#. 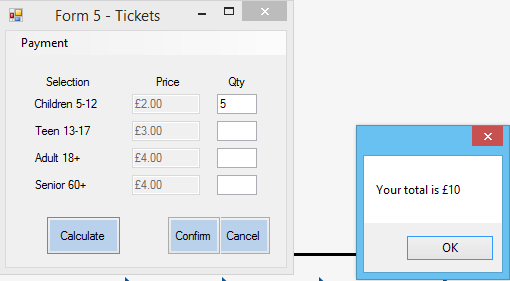 The user must be able to enter a value into the four blank textboxes. 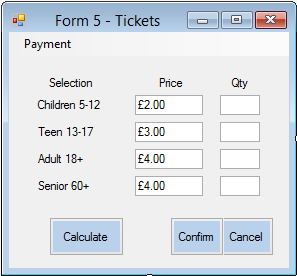 The numbers in the textboxes should multiply with their set prices when the user clicks on Calculate. In other words, I want the four textboxes to multiply with their price. Here's the calculation code. I managed to get the Children 5-12 textbox to calculate. The Try Catch block was changed because you should only handle system errors in Try blocks. The price can change, and can be changed to include cents and fractions of cents. The price will only remove "£" and no other currency logos. The Qty will always be an int since you can't have 1.5 children. You are ok with the system error being shown in a message box to the user instead of being logged somewhere. Since this was quick, the code could be expanded on to remove some of the assumptions and to add rounding.